There has been some on-again, off-again chatter about the possibility of snow Thursday in the St. Louis and Indianapolis metro areas. There may be a slightly better chance for Indianapolis than St. Louis. The problem for places like St. Louis, Indianapolis and places in between is the track of the storm. It is mainly going to be rain. There could be a few thunderstorms. In fact, there is the potential for severe thunderstorms over southern/eastern Missouri, extreme southwest Illinois, Arkansas and extreme western Kentucky.. The Storm Prediction Center has a “Slight Risk” area indicated in yellow for severe thunderstorm development. The main threat will be damaging straight line winds although a few tornadoes can't be ruled out. The below outlook is valid from 6am CT Wednesday through 6am CT Thursday. Here is a look at what the European forecast agency’s global computer model is showing for 6am CT Thursday morning. 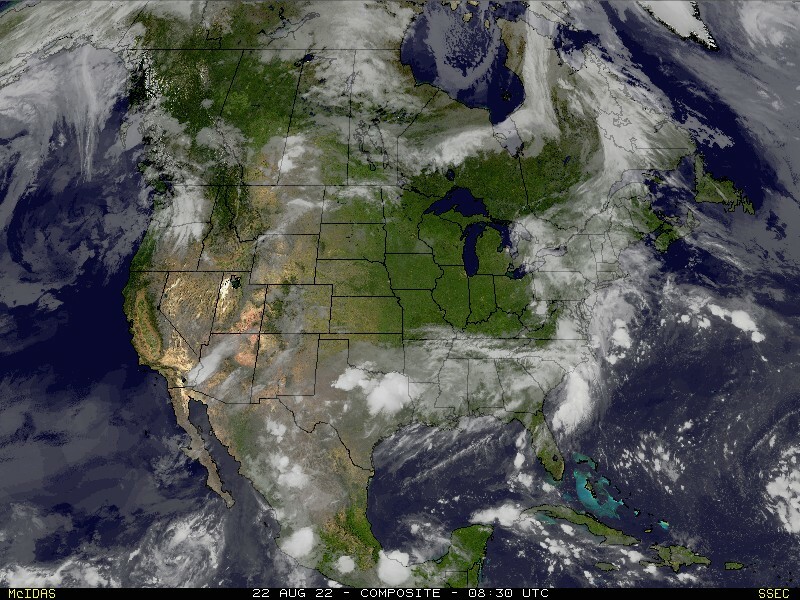 The area of low pressure is centered over northern Illinois. Rain is basically everywhere right of the blue dashed line. A line of thunderstorms will go through southern Missouri and Arkansas during the overnight hours Wednesday/Thursday. Cold air will be filtering down the backside of the low and behind the cold front. This will allow for some changeover from rain to snow in a few locales. But look at the next map. This is 12pm CT Thursday. The low is now centered over Lake Michigan. The cold front is crossing the Indiana/Ohio border. Cold air is filtering in to eastern Missouri and southern Illinois. The model is keeping some precipitation around the St. Louis metro area while the cold air is filtering in. However, I think the cold air will be late arriving and the precipitation will be early leaving so there can’t be much of a meeting with the two. I am also thinking there could be a dry slot coming in behind the cold front and the dry air could help soak of some of the moisture. Right now, I think at best we could see a couple flurries, but even that may be hard to see in St. Louis. 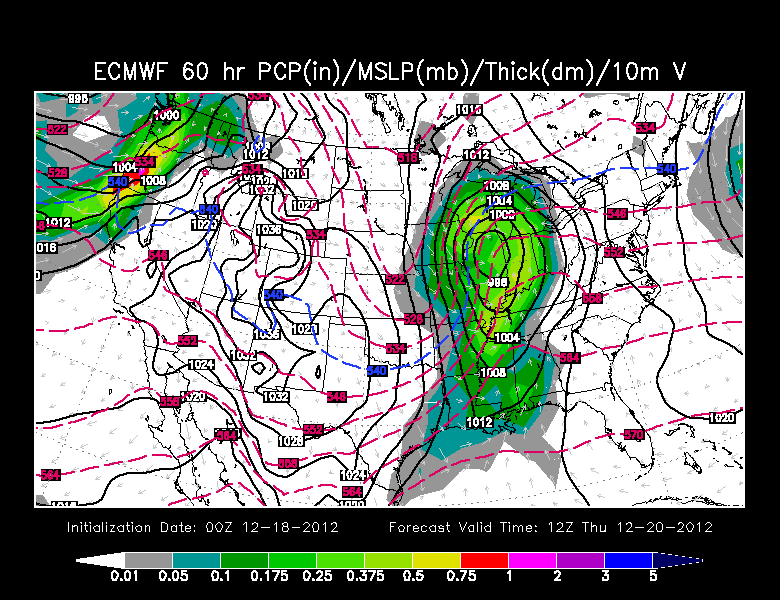 As for Indianapolis… The cold air might be able to get in quick enough to interact with the moisture. Having said that, the prospects of a lot of snow is low. I’ve looked at four different computer models and they are all suggesting anywhere from nothing to as much as 0.5” of snow. Realistically, I think you could be talking about a dusting to 0.25”. Updated: 11:45am - I want to remind everyone that lives in the areas mentioned above with the severe weather chances to have your NOAA weather radio turned starting tomorrow evening and make sure the batteries still work just in case. Everyone keeps asking about the prospects of a White Christmas this year. 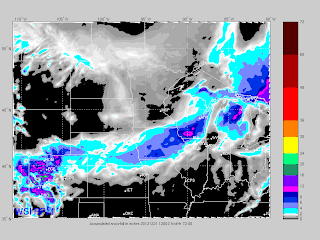 The definition of a White Christmas is 1” of snow on the observation at 7am ET/6amET. This year the chances are looking pretty dismal. I would put it at less than a 2% chance for Indianapolis, St. Louis, southeast Missouri, southern Illinois, and western Kentucky. Computer models are starting to spin up a large storm over the Mississippi and Ohio river valleys but guess when it happens. Eight to nine days out, December 26-27. If you’ve been following along with my blog this month, this will sound familiar. 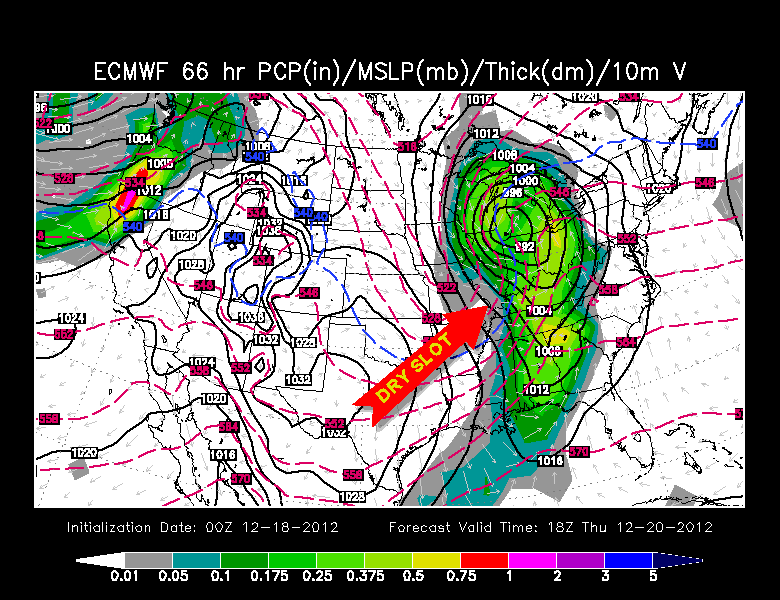 The models for weeks have been showing significant storms 8-10 days out and none of them have come to fruition. I’ll keep an eye on this one but as I’ve said before, don’t hold your breath.